Getting ready for back to school does not just happen overnight. I can tell you that it’s a process and sometimes a stressful one because there’s so much to do in preparation! My girls are both in school full-time with Olivia in grade 9 and Bridget in grade 3. Since there’s such a large gap in ages between the two, I end up having to make a list for each kid and what I need to buy and do to get them set. One thing I can say that helps with preparing for Back to School or anything for that matter is having a good organization system and for that’s creating a To-Do list. I’m the queen of lists and make one for just about any kind of occasion that requires planning. Instead of a writing a list via pen and paper, I now use my iPhone to create my lists using a nifty little app called Awesome Calendar. It’s a lifesaver, trust me! I can make lists and keep track of upcoming appointments! I wanted to share with a few of the ways we get ready for back-to-school. I usually start at the beginning of August and often it carries on until after school starts in September. I like to give myself ample time! 1. School Clothes: Every year we head out to the malls or local department stores in the city and go shopping for school clothes. My mom did this with my sisters and I when we were younger and I always looked forward to having a new outfit to wear on my first day of school. Let’s not forget the obligatory indoor sneakers for gym class either! This year my mom took both my girls shopping in Ottawa and bought all their school clothes. I was so grateful that she saved me the trip! 2. Fall Wardrobe Cleaning: Each season I like to go through the kid’s clothes and remove clothes that don’t fit or that they don’t wear anymore. This makes room for the new school clothes. It’s good to donate the clothes you don’t want to Goodwill. 3. School Supplies: I started school supply shopping in August and did much of my shopping online and had everything delivered. It saved me on gas and driving an hour to the nearest store and I also was able to get free shipping! However, once the kids start school there’s usually a few things that the teacher requires they have and then a trip to the store is warranted. 4. Haircuts: It’s always nice to start the new school year with a fresh cut. Normally their hair grows faster in the hot weather and I don’t want them to have bangs in their face and bothering them while they are trying to learn. Both girls are growing out their hair so it’s also important to take care of split ends so their hair stays healthy. Speaking of haircuts, I have a special offer to tell you about! 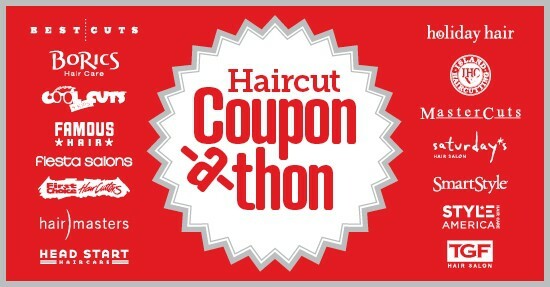 Right now you can get a kid or adult haircut for only $7.99 ($9.99 in select markets) in the SocialMoms and Regis Family of Brands’ “Haircut Coupon-a-thon! These salons also offer other services like highlighting, waxing, colour, perms, etc as well as selling name brand shampoos like Paul Mitchell and Redken. Besides the amazing price offered for this event, what I also love is the no appointment required policy at these salons so you can go when it’s most convenient for you and your family. To get your coupon, visit Beauty Bargains blog and input your zip code and salon. The coupon is valid until September 30, 2012. This offer is open to adults too so the whole family can get a new, updated look! You can’t beat that price! Trouble printing coupon? Email [email protected] with the salon brand you’d like to visit and they’ll send you a coupon. What is your process for getting ready for back to school? How far ahead in advance do you start getting ready? Great savings from Regis for discounted haircuts for childen, great savings for school!